Can our beloved maestro delight the masses by conquering clay once again? Unfortunately for Federer and his fans, the answer is no, though I would love it if he wins Madrid. Nadal is the heavy favourite, Djokovic and Thiem are second with Zverev (no sarcasm) coming after them. Federer will have a hard time winning it. I think he can. It's only a Masters 1000 for Nadal, so he could save energy for RG, and looking at Djokovic form this year in his non-Grand-Slam and his Grand-Slam, I'd say he probably doesn't want to play peak at Clay Masters. Federer wants a great comeback, so I think he can, although I'd say Zverev is the favourite. Him winning Madrid at this point would be about as impressive to me as winning Wimbledon. Let’s see here. Federer has had a 3 year layoff from his worst surface. The only good news is that he is only 37 1/2 years old. Federer might make it to the round of 16 with a cakewalk draw. When's the last time Fed stepped onto a clay court? Do you think he had a single practice session during the past two years? It's the only clay event where I could see him making a run. It plays much more favorably than MC/Rome or RG. Having said that I'd be very surprised if he did better than a QF. 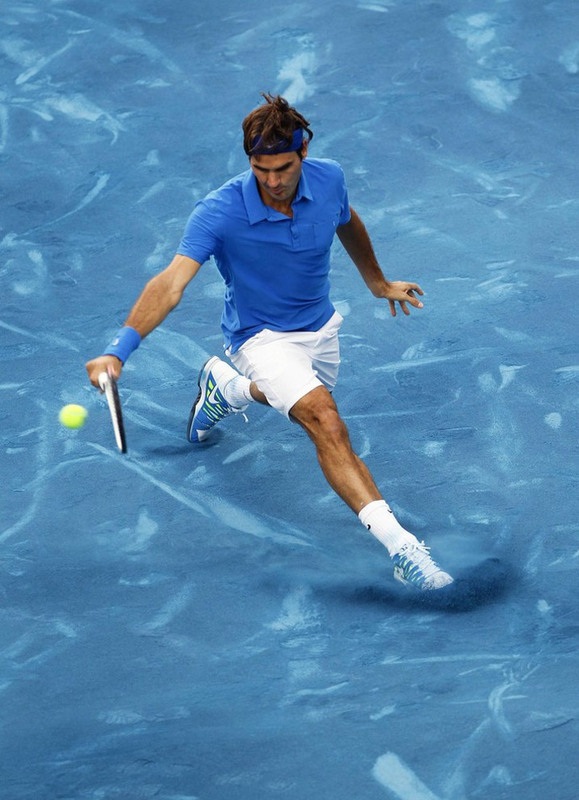 If Nadal skips Madrid or loses early which I think is likely, Federer has about.. 21% chance. Undoubtedly, percentages coming straight out of Uranus. No.Federer won't win more slams, YEC or M-1000. If the conditions are extremely fast, he has a chance to reach the latest stages and even win it, depending how the other opponents play, but the conditions probably won't be perfect for him. Realistically a QF appearance would be a good result. If they bring back blue clay, he'll be a shoo-in! Hey, anything is possible. The guy has surprised us so many times before. Never in a million years did I think he'd conquer Nadal, at a Slam, in the 5th set, down 3-1. Him winning Madrid seems less daunting than pulling out a win in that scenario, no? iirc, he mentioned during the 2017 clay season that he was still practicing on hard courts, and not even on clay. That lead to a lot of speculation that he'd pull out of the French before he even announced it. So it's possible he never even stepped on the dirt that year, but I'm not sure. The last clay event Federer played was 2016 Rome (l. to Thiem in the 3rd round). Therefore 3 years will have passed when he next sets foot on a claycourt at 2019 Madrid. He last won it in 2012. Lost in 2015 to Kyrgios albeit in a massively tight 3 setter. If Nadal and Novak don't take it very seriously his only competition is Zverev and Thiem? 30%. No but I'll back him to reach the QF and with some luck SF. It's not like he's incompetent on clay. His last 3 losses on clay were against Thiem, Tsonga and Stan, hardly shabby. Federer hasn't won a masters title since Shanghai 2017. He's not made a slam SF since AO 2018. Then add to that, it's on clay. He made the Rome final in 2015 before getting easily beaten by Novak. He was better the year before where he came close to winning Monte Carlo. The point is, it's been a long time since Federer has won anything like a masters, and much longer still since he actually played well on clay. His last clay masters win was Madrid 2012, where both Djokodal lost earlier. He was only 30 at the time. Now he's 37. Nadal should watch out for Opelka. Federer's mind and soul are already at Wimbledon, where he plays his last chance to go far in a big one. Roland Garros is just a pretext for the ovation and applause of the public. I am just cirous to see how he doesn on clay since he hasn't played a competitve match series on the surface in quite some time. Practice and practice matches are only gonna do so much, and who knows really how much of that has happened. He could win a match. I've only been to the Madrid event once, in 2004 when it was still indoors and not on clay. It was only the second match I was privileged to watch with Safin, who defeated Nalby. Never saw it the Madrid event on clay. But I will guarantee you it's not the same or as great as either IW or Cincy. No way! Quite honestly, I would be scared if Fed played Schwartzman on clay. I don’t think that Fed can beat that little guy on clay. But it will be fun watching Fed play anyway. Quite honestly, I would be scared if Fed player Schwartzman on clay. I don’t think that Fed can beat that little guy on clay. Schwartzman would be a tough match. He'd really force Federer's ground game to be sharp and even if Federer won, it'd probably be grueling enough to damage him for the next round.